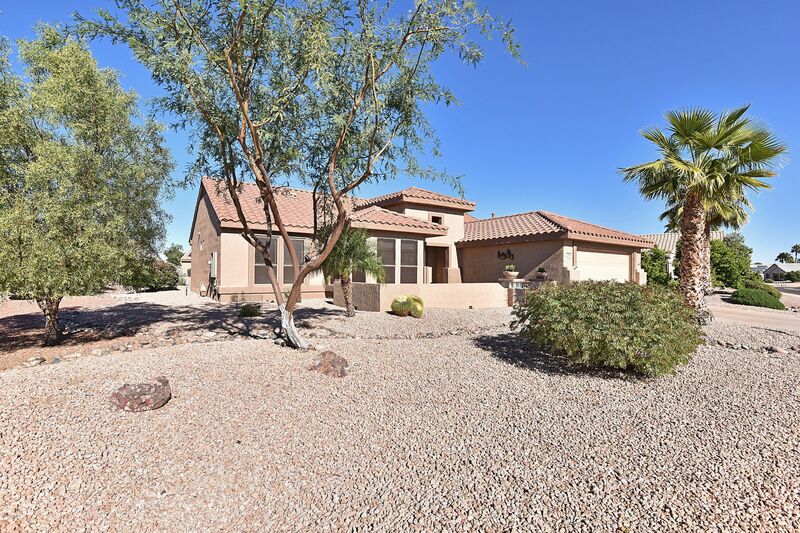 Del Webb's Most Popular Floor Plan, The Palo Verde! Popular For It's Split Bedroom Configuration With Guest Bedrooms Located On The Opposite Side of The House Providing Guests Ultimate Privacy. Listed by Leolinda Bowers, This Sun City Grand Home is Beautiful From The Front Courtyard Patio To The Huge Backyard Patio! Home Is A Magical Gem Like No Other. The Wide 10,800 Sf Lot Is Ideal For A 3rd Car Garage. Light And Bright, With Perfection & Detail Inside Features and Upgrades Include Crown Molding Throughout, Custom Floating Media Wall, Plantation Shutters, Warm Decorator Colors, Quartz Counters, Additional Kitchen Cabinetry, Pull-Out Drawers, Stainless Appliances, French Door Refrigerator, Popular 6-Panel Doors, Bay Window In Breakfast Nook, Master Bedroom Bay Window, Inside Laundry And Utility Sink. Meticulously Cared For With Heating And Cooling Replaced In 2017. The Large Yard Affords Privacy Galore; Its Extended Covered Patio Pergola On The North/South Lot Has An Outdoor Kitchen, A Private Enchanting Grand Oasis!